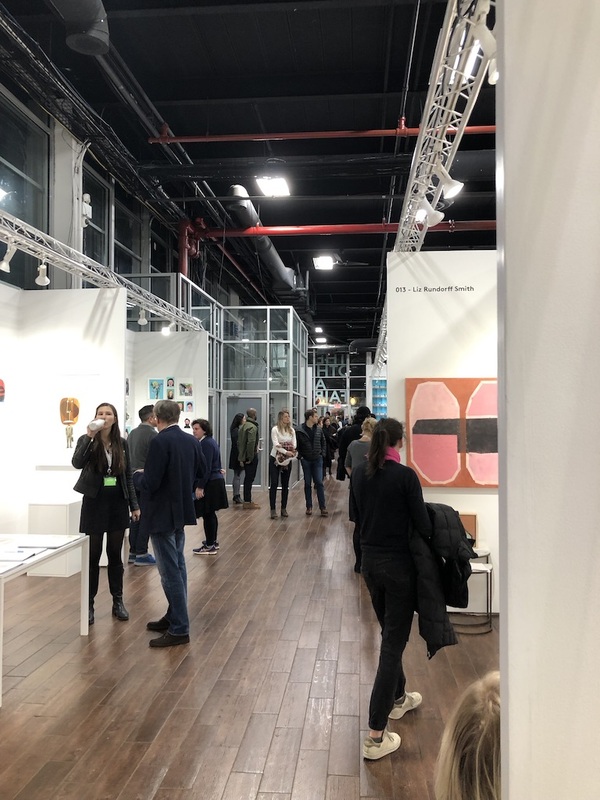 This past weekend, the Brooklyn Expo Center hosted The Other Art Fair presented by Saatchi Arts. The fair features hundreds of artists in total and displays works in a number of different mediums, including oil and acrylic painting, sculpture, and photography. Luckily, the fair is also traveling to Chicago, Los Angeles, London, Melbourne, and Sydney through May of 2019, so there is plenty of time to still see wonderful art if it's coming to your city. There are many elements that make this fair special, but by far the most important is the fact that the booths are comprised of the artists selling their work themselves. There are no private galleries or public groups displaying a range of artists like at a common art fair; The Other Art Fair has taken out the middleman. Instead, the artist is standing right next to you, so an awesome and somewhat rare connection between the artist and the buyer can be made. The Other Art Fair truly is "an art fair for a new generation" -- as it is described online and in its sleek fair guide -- because it utilizes technology and creates a space for new art buyers. Before the fair even began, visitors were encouraged to download The Other Art Fair app which is filled with helpful information. Once you select which location of the fair you're attending on the app, there is a tab to read about all the artists who have booths, and a list for you to fill in the artists you are most interested to see or speak to. The app also has floor plan layouts for almost every city with numbered booths and a peek at where vendors will be. The vendors and featured companies of the fair are also fantastic. The Sketchbook Project and the Brooklyn Art Library had a small Bookmobile parked in a corner of the fair filled with finished sketchbooks from people around the globe. There were DJ sets in the evenings, a bar with great mulled cider and snacks, plus a stick and poke tattooing booth featuring Bluestone Babe. Artist Carl Grauer had a corner booth dedicated to his series, "Two-Hour Portraits," in which visitors could pay to have their portrait painted right there at the fair. It was an absolute blast to watch. For anyone who is younger, has a limited budget, or is looking to get into the art-collecting game, this is the fair for you. 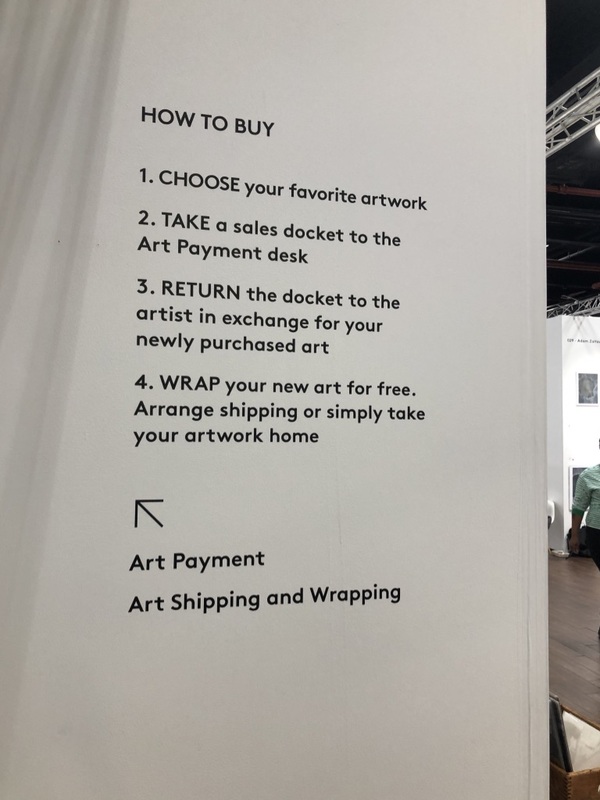 Not only is there a step-by-step guide on how to buy a work on The Other Art Fair's app and in the general fair guide, but also the steps are proudly displayed on a wall right at the entrance of the Brooklyn Expo Center. There was a wide range of pricing as well. Some artists had prints for as low as $30, while others had huge oil paintings for upwards of $5,000. There was, however, an abundance of art priced under $200. This may seem like a lot to drop on a piece of art, but these prices are such a shift from any major art fair. A 2017 Huffington Post article reported on an Art + Auction survey that listed typical booth prices of various art shows across the world: Art Basel with an average of $58,000, the Armory Show with an average of $35,000, and the Dallas Art Fair at $17,500. Attending some of these huge art shows is a completely different experience from attending The Other Art Fair. 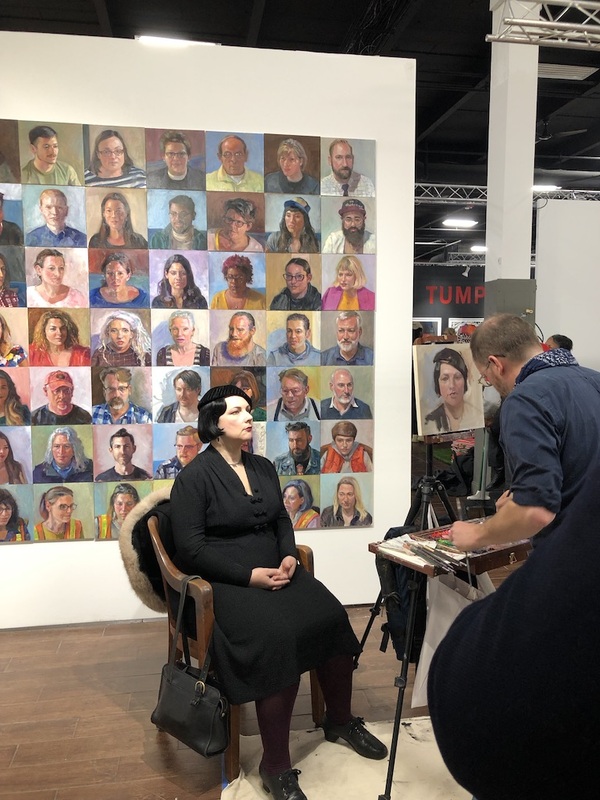 Art fairs are becoming increasingly important as the international art community constantly changes, but the big art shows, like the ones mentioned above, seem elitist and created only for a niche community of art buyers. Going into an art fair with average booth prices at thousands of dollars is intimidating for many audiences: students who are looking to expand their knowledge, young artists hopeful to have art accepted by a gallery to show at these fairs, essentially anyone in lower tax brackets. There is almost an unwelcomed attitude towards these growing audiences at huge art fairs. Opposed to the audiences of the big art shows, which mainly consists of upper-class, older white folks, the audience of The Other Art Fair widely ranged in age and race. The Other Art Fair is the art fair for all art lovers. It is accessible to a large community of diverse people and has excellent art that no one has to take a loan out to purchase. Catch The Other Art Fair in one of the other five cities it is traveling to over the next few months -- you won't be sorry.